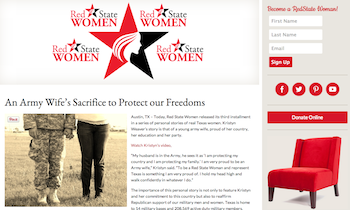 Have you seen Red State Women’s latest video? It’s their third installment in a series of videos telling the stories of Texas women. Kristyn Weaver is an army wife. She is proud of her husband, her country, and his service. You really don’t want to miss this video. Read her story here. See her video here. The importance of this personal story is not only to feature Kristyn and her commitment to this country but also to reaffirm Republican support of our military men and women. Texas is home to 14 military bases and 208,569 active duty military members, 31,756 reserve members, 24,986 State and National Guard members, and 58,435 civilian members.